As you know, there is a murderer seeking refuge under my roof. The upside, this gives me a crime to solve. The downside, I can’t trust anyone. I turn to you. Your wisdom, insight and crime fighting super powers. 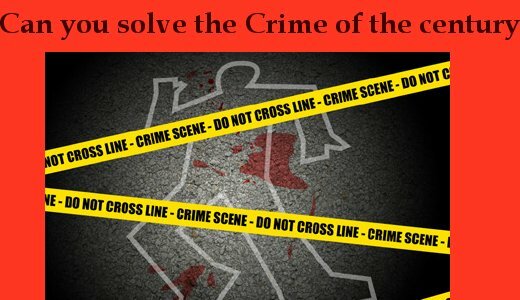 Can you solve the Crime of the Century? In case you missed it on Monday ( click here) Here are actual crime scene photos …. As you can see there was a throw pillow murder. Person of Interest #1- Dante, was found at the scene. Crime Scene photos show 2 other persons of interest looking at the scene. 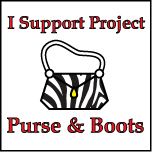 Now here are the facts, put on your investigative face and work on this case! A 4 year old beige throw pillow was resting gently in the chair of the family room. Last seen un-murdered at 1230am by Detective Peach. At 945am Detective Peach entered the family room to find a murder scene. Immediately photos were taken and the crime scene was secured. The throw pill remains were checked for spit, saliva, drool and prints. None were found. Myself ( Detective Peach), The Droid 53 yro adult male, ThePrince 10yro male, and The Stunt Kid 9 yro male, Mei 8 yro female black lab, Loki 4 yro male Dalmation, and Dante 9 yro female feline. Everyone above had access to the victim and the crime scene and were present in the home during the time frame of the murder. Fact: no prints, spit, drool, teeth marks, claw marks, were found. Fact: no one had any of the victims remains on or near them when I approached the scene. The Droid and I ( Detective Peach) were sleeping, and corroborate each others alibis that we were sleeping because we both inadvertently wake each other up when we leave the room, also, we have no motive to murder the beloved throw pillow. The Prince and The Stunt kid both claim to be sleeping upstairs in the rec room and claim no knowledge of the incident but did assist with crime scene clean up and began speculation as to suspects. Both have no previous criminal record other than eating the last of the homemade strawberry jam. Mei- the 8 yro female black lab has hip problems, and a fair temperament, she has a criminal background due of misdemeanors to her excessive addiction of hole digging on our property and has been known to feed that addiction multiple times a day, as if she were Lindsey Lohan without cameras around. Additional misdemeanor charges are frequent and powerful farts. Dante- 9 yo female feline, horrible attitude and retained legal council and sued Det Peachy during a previous investigation of computer hacking. Varied and large misdemeanor background, involving, Christmas present unwrapping, Christmas Tree climbing, multiple attempted thefts of dinner ( usually involving poultry), and charges of laying on my kitchen counters. Felony convictions include: attempted murder of the family hamster, murder of 10 pairs of shoes via cat vandalism ( pissed on my freaking shoes), and over 35 felony counts with convictions of feline urination in improper locations. Strong dislike for authorities. Mei, Loki and Dante have all plead the 5th. Refusing to speak during repeated interrogations. Non of the AOI ( animals of interest) have shown any remorse and are basically void of all emotions during questioning and when presented with evidence from the scene. At this time we are not releasing an “official suspect” only Animals of interest. Below are former mugshots from previous run ins’ with the law. 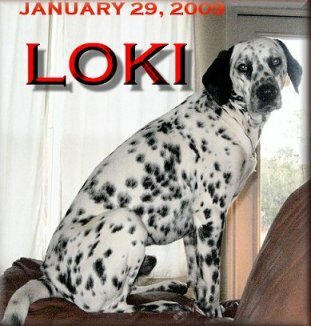 Loki the Neurotic Dalmatian is always on guard. Due to previous litigation I am not allowed to really speak freely about Dante. You form your own opinion. So now you have seen the Animals of Interest, you have their backgrounds, and you have the actual crime scene photos which show all 3 of the AOI. With the information provided I can only venture a guess, which would only add to the speculation of the previously mentioned suspects. Closer examination of the victim may be needed…you do have Doc Robinson on his way, right? While the crime was taking place were there any suspicious noises heard? Crashing, banging, anything else disturbed at the crime scene? Given the assumption that there were no other victims during this crime spree I would have to presume that the target suspect should be Dante. Mei and Loki both appear to be the sort to make quite a bit of noise during such criminal sprees or at least are not single target criminals. However, given the information that Mei doubles as a throw pillow for the Prince it would also be reasonable to assume that she had reasons to be jealous of the beloved aged throw pillow, thereby making this a crime of passion. Other victims may still be on her hit list. Loki does have a background in destruction, thus making him a prime suspect of a different nature. However, given his neurotic guarding tendencies he could have seen the larger throw pillow as a threat of suffocation to Det. Peach, thereby wished to minimize the threat. He took affirmative action to reduce the size of the pillow, but having lacked thumbs and sewing talent was unable to surprise the Det Peach with a new set of smaller throw pillows. 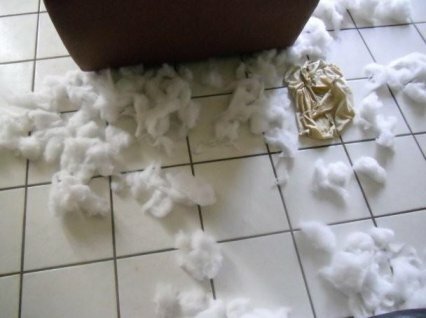 It was too late for the throw pillow by the time he realized this so in an effort to not draw attention to his neurotic tendencies even more he threw the polyfil about the room in an effort to throw the scent off of his trail. I believe it would be safe to presume it was neither the Prince nor The Stunt kid. It does not seem to be a crime that either would commit alone and since neither is ratting the other out it is safe to assume their innocence at this time. Same story for Det Peach & The Droid – innocent. Det Peach would have no motive to make the mess only to have to clean it up again later – at least not a mess of this particular nature and with the extended relationship between the Droid & Det Peach it is safe to assume that The Droid values his life and thereby would not leave such evidence laying where it can be discovered by Det. Peach. 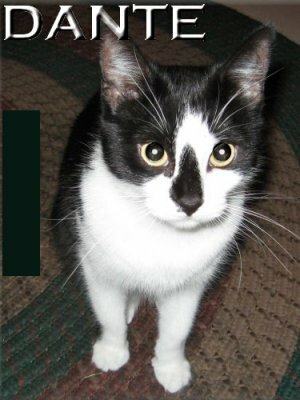 Without an autopsy report I would have to say Dante – just look at her eyes – they have “guilty” embedded in them. Rachel, I expected you to appear in quick fashion to again represent Dante. I appreciate your offer and will take it to the DA but at this time we are unable to make any deals at this juncture of the investigation. 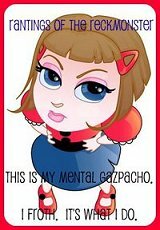 I welcome you and your clients assistance with any details she may have knowledge of. Stephi, excellent profiling of all the Animals of Interest. I can attest that during questioning, all humans reported hearing NOTHING, however we can not assume the crime itself was silent. As Myself ( Det Peachy) and the Droid were 4 rooms away and sleeping, and The Prince and Stunt kid were on another floor also sleeping. With the layout of the structure having been designed by me, with family comforts out ranked only by the ability to deflect noises in other rooms so that we may sleep in peace. Case in point, I can not hear a knock on the front door from the family room. Or a child can play a trumpet in an upstairs bedroom and not be heard. We have on more than 1 instance had people come in the house with all of us in the same areas we were in during the crime and had no knowledge anyone was in the house, picking out videos or watching TV. However on the night of the crime I can tell you that all exterior doors were locked and the people/animals listed in the report were indeed the only beings locked inside the home during the crime time frame. The autopsy was preformed and reported only that the victim was DOA with no teeth, claw, or drool. In fact the Coroner stated that if it wasn’t completely absurd he would have opted for TPSC- or Throw Pillow Spontaneous Combustion. But there were no burns/ashes, heat sources or accelerants to be found. Now that I’ve seen all the suspects, I’m getting a ‘vibe’ off Loki. See the way that suspect is just peeking from behind the door? Very suspicious, if you ask me. Nah! I still think it’s Dante. I am of the belief that this was a failed plot of terrorism. 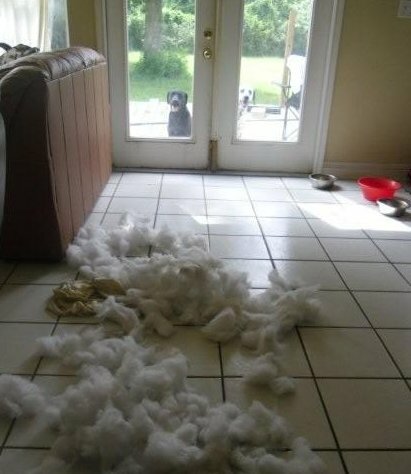 The deceased pillow had investigate different explosives, settling on something very volatile. An incorrect mixure later – KABLUEY! With that information…the lack of claw marks/shredding of the cloth I’d have to say that eliminates Dante, who was my prime suspect…. You don’t happen to have any walking catfish in the home would you? Or…maybe the complete absence of claw marks pins Dante as the prime suspect…her paws are small enough to fit in any opening that may have already allowed access to the poly fil in the first place. Details have come to light in the investigation. Dante is void of front claws due to a cosmetic procedure 7 years ago. In addition, she has assaulted a pillow previously, although it was a hate crime where she urinated on it. We are unaware of any incident involving her in a violent fashion, she falls in the profile range of “domestic terrorism” than violent assaults. I am beginning to see a trend of profiling here. Just because Dante is a “cat” everyone assumes she is guilty. Come on people lets be fair. All cats are not evil. There are plenty of cases of “bad dog”, where else would you have heard that popular phrase. 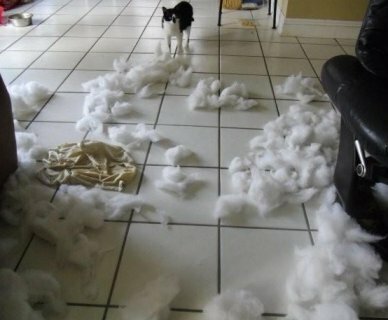 No one screams “Bad Cat”…..That pillow was 4 times the size of the cat…. If the Pillow doesn’t fit, you must aquit! Maybe we’re looking at this all wrong. Could the pillow have committed suicide? It is always the butler! While others would argue that you’re audience are not only unqualified, possibly bias, but prematurely barking up the wrong tree. I would have offered, in an attempt to appease those that would seek to discredit the brave detectives, a non-bias, highly sought after and over qualified detective. I would have offered… yes, The Highly Qualified – Pet Detective lovingly known as “Snoopy”. Unfortunately due to the overwhelming number in crimes these days The Great Detective is unable to make it on such short notice… His understudy (i.e. Woodstock) said that The Great Detective is booked as much as 1 yr out, so if you’re in need of his assistance in the future Woodstock recommends scheduling your caper investigations accordingly. Where was the victims last known location? Where was the last visual / known whereabouts of the AOI’s prior to self induced narcolepsy of the humanoids? When was the last oral intake of both canine and feline breeds? Has either one of them showed any signs of depression? Chewing on things, knocking things off of tables, loose stools, frequent urinating in areas that are off limits? Recent separation anxieties? –	Have you tried Biscuit Boarding similar to water boarding, but with fishing line tied to their favorite Biscuit suspended overhead and out of reach? –	Have you tried wrapping the cat in shaved ham and then show him/her the French door and the party of teeth on the other side of said door to whom I might add, have all of a sudden become Very Interested in this feline? That can work two ways… you can show the two dogs the evidence through the glass while blocking view of the prized cat where you may catch a darting accusational glance towards one or the other, or telltale signs of flattening of the ears and lowering of the head in direct relation to their realization that they may not get the prize due to their own admitance of guilt. You can do the same with the cat and quite possibly gleam a look at the flashing embarrassment or disgust followed by a quick look of hell towards the real salivating crazy eyed canine culprit. –	Remember that cats are deviants and dogs are gullible to a fault. It may take several tries to teach a dog a trick in which they will perform for years to come, but the cat will never let on that they understand the lesson, but are unwilling to perform such embarrassing tricks of public display. –	When shown the evidence was there any urination present? Either by the AOI’s or the Droid that would give way to guilt? In light of the lack of investigative evidence thus far, I need to request that samples, swabs, and yes even black light dusting be taken and all findings to be provided and accessible to us – your humble volunteer investigators for further scrutiny. Also, if you would test the materials for taste and odor… the findings could be quite interesting and possibly conclusive, if nothing less than comical where as pictures of the performing testers (not to be confused with testis) must be provided during said testing and posted here for public review by our team of higly entertained humorous investigators. –	65 different occasions of laying head on lap while sitting on the floor and looking up at you while you sit watching tv. Or all of the above can be waived for agreeing to not pee on or in anything but the designated areas which could include the Droids shoes, slippers, bathroom sink or shower. 😉 They are also NOT allowed to leave the confines of the yard while this investigation is underway. – Have you tried Biscuit Boarding similar to water boarding, but with fishing line tied to their favorite Biscuit suspended overhead and out of reach? – Have you tried wrapping the cat in shaved ham and then show him/her the French door and the party of teeth on the other side of said door to whom I might add, have all of a sudden become Very Interested in this feline? That can work two ways… you can show the two dogs the evidence through the glass while blocking view of the prized cat where you may catch a darting accusational glance towards one or the other, or telltale signs of flattening of the ears and lowering of the head in direct relation to their realization that they may not get the prize due to their own admitance of guilt. You can do the same with the cat and quite possibly gleam a look at the flashing embarrassment or disgust followed by a quick look of hell towards the real salivating crazy eyed canine culprit. – Remember that cats are deviants and dogs are gullible to a fault. It may take several tries to teach a dog a trick in which they will perform for years to come, but the cat will never let on that they understand the lesson, but are unwilling to perform such embarrassing tricks of public display. – When shown the evidence was there any urination present? Either by the AOI’s or the Droid that would give way to guilt? – 65 different occasions of laying head on lap while sitting on the floor and looking up at you while you sit watching TV.